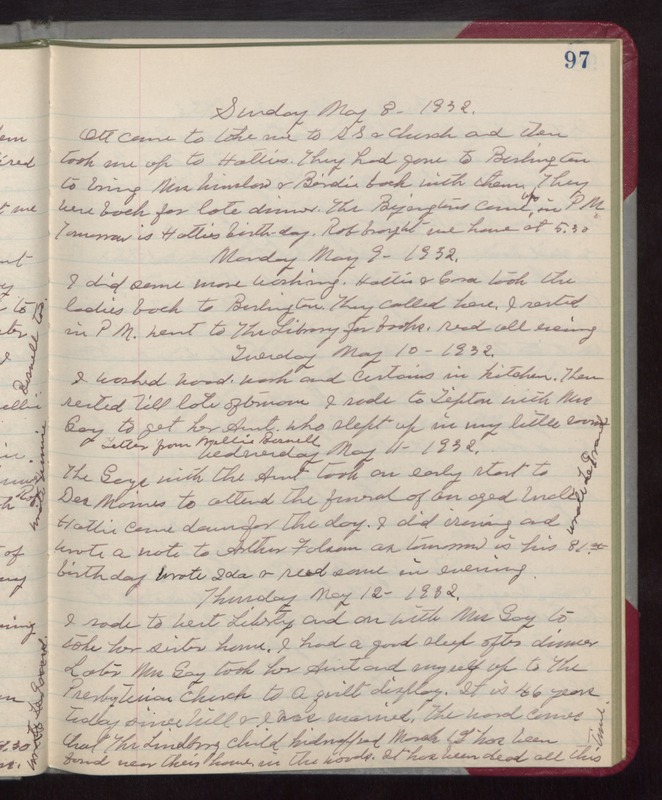 Sunday May 8- 1932. Ott came to take me to SS & Church and then took me up to Hatties. They had gone to Burlington to bring Mrs Winslow & Birdie back with them. They were back for late dinner. The Byingtons came up in PM Tomorrow is Hatties birth-day. Rob brought me home at 5.30 Monday May 9- 1932. I did some more washing. Hattie & Cora took the ladies back to Burlington. They called here. I rested in PM. went to The Library for books. read all evening Tuesday May 10- 1932. I washed wood-work and curtains in kitchen. Then rested till late afternoon I rode to Tipton with Mrs Gay to get her Aunt who slept up in my little room Letter from Nellie Boswell. Wednesday May 11- 1932. The Gays with the Aunt took an early start to Des Moines to attend the funeral of an aged Uncle Hattie came down for the day. I did sewing and wrote a note to Arthur [Folsom?] as tomorrow is his 81st birthday Wrote Ida & read some in evening. wrote LeGrand Thursday May 12- 1932. I rode to West Liberty and on with Mrs Gay to take her sister home. I had a good sleep after dinner Later Mrs Gay took her Aunt and myself up to The Presbyterian Church to a quilt display. It is 46 years today since Will & I was married. The word comes that The Lindburg child kidnapped March 1st has been found near their home, in the woods. It has been dead all this time.